Ferrer is an international privately-held pharmaceutical company, with headquarters in Barcelona and a presence in more than 90 countries. Our mission is to advance the wellbeing of society. As such, partnering is critical to Ferrer. We want to ensure that our own products reach those who need them, no matter where they are. Essential to Ferrer’s mission to advance the wellbeing of society is the need to raise awareness. We aim to communicate healthcare issues and solutions so that people can make informed decisions about their health and wellbeing. Here you will find a selection of resources to find out more about Ferrer’s work across the healthcare spectrum. Ferrer offers innovative solutions over the entire healthcare spectrum. Prescription drugs, hospital equipment, personalized medicines, vaccines, consumer healthcare, fine chemicals, food and feed: we offer a wide range of products which meet the highest scientific standards. Ferrer is an innovative pharmaceutical and chemical company. We discover, develop, manufacture and market innovative products to advance the wellbeing of society. As a fully integrated company, Ferrer has maintained a longstanding commitment to its industrial activity. In Ferrer, our mission is clear. It is our absolute conviction that the purpose of a business is to contribute to the society it serves. The Ferrer Research Foundation has, since 1985, awarded the Severo Ochoa Prize for Biomedical Research. Professor Ochoa, winner of the 1959 Nobel Prize in Physiology or Medicine, kindly gave his permission to Carlos Ferrer Salat to put his name to this award. This area contains information directed exclusively to health professionals trained to prescribe or dispense medications. 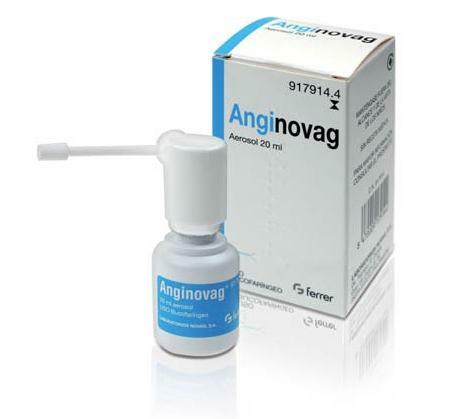 Anginovag reúne en su fórmula principios activos de acción antiinflamatoria/analgésica y antibiótica. Se presenta en forma de spray con válvula dosificadora para el tratamiento preventivo-curativo de las afecciones bucofaríngeas. Contact Ferrer and we will attend to you as soon as possible.